Writing “free” notation in jazz for pitched instruments is a challenge. While rhythm section players are used to making up their parts (reading chord changes, following ensemble figures with rhythmic notation), there might be some head-scratching at the session in the horn section if you’re intent isn’t clear. Also, it never hurts to explain what you expect before you give the downbeat. Just like free rhythmic notation for rhythm section, which I covered in an earlier post, Scoring and Controlling Improvisation #1–Rhythmic Cells, there are two techniques I’ve used a lot: box and arrow, and what some call spacial or proportional notation. In this post we’ll look at a few ways to box a cell, or motif, and how this technique can allow you to create interest, free up the feel, and guide the player through your piece. I’ll save spacial notation for the next installment. In other words, you need to get the proper vibe happening, and define the texture and some musical boundaries before you set the player free. It’s all about your intent, and the sound you want–a little improv and looseness in the pitched instruments goes a long way. …then after a while, after the melody is firmly planted in the tune, he can ad lib using slashes. The result is a fluid transition from a notated part to an improvised part. …which continues for a while, building tension. The background figures and the tonal movement is firmly established, the flute and the soprano sax are let loose. 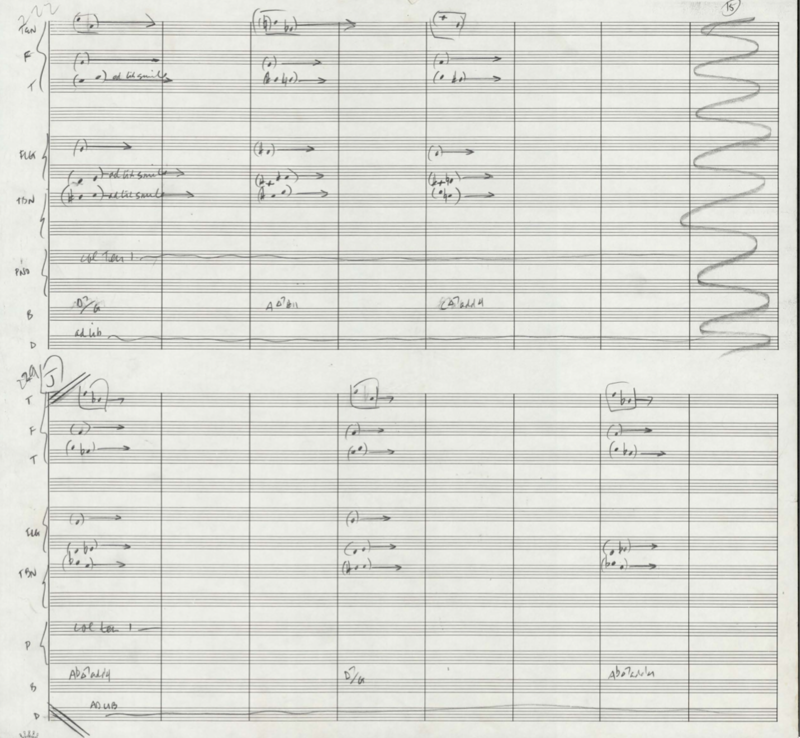 They work with the brass (still written-out) while the tenor sax blows over the ensemble. There are three layers happening, and the effect is unity, but also freedom. The next section begins with a stretto, then moves to the last section, using the descending fifth motif. Using “box” notation (here indicated by parenthesis around two notes), I’m able to express the harmony and create an undulating texture under the soloist. It’s more effective in a piece like this than writing footballs. 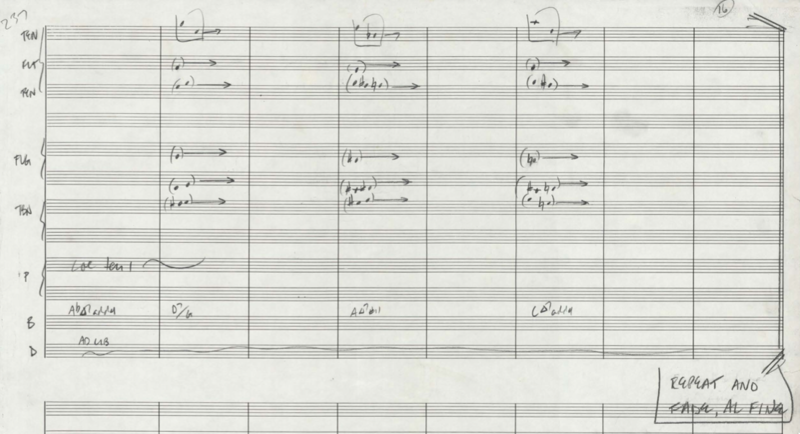 Here’s an audio clip and score of the final section of “Andy’s Tune”. Follow along. Sustained chords establish the harmony. Repeated notes begin the undulating texture. Cell improvisation in the flute and 1st flugel is set up by the preceding material—the player is free to improvise within specific boundaries, using the established rhythm and one note, here indicated by parenthesis and “ad lib simile”. As the section devolves and develops some players have one note, some have two to improvise on. The tenor soloist continues using his two note descending 5th figure, and the rhythm section has chord changes. I chose the notes to fit into the chords, but also to imply movement and dispersion of the harmonic texture. This section repeats and fades out. Ok, I’ve had enough for one night. Time to watch a movie. Gallery | This entry was posted in Free Jazz, Improvisation, Jazz Composition and Analysis, Scoring Free Improv, Theory and Harmony and tagged arranging, classical music, composition, contemporary music, free jazz, Harmony, improvisation, jazz, jazz analysis, jazz arranging, jazz composition, jazz theory, music theory, Orchestration, scott healy. Bookmark the permalink.